I was at the grocery this morning and when I am standing in the long lines, I like to look in others carts to see what they are buying for this "all-American" meal. Boy it seems, generations of wall street ads has affected the way we now prepare this traditional meal. I mean who am I to judge? But there just isn't anything traditional anymore that is "homemade" and why is that? Because the commercial brand names are cheaper. Everything was on sale this week. My mom used to make her own old-fashioned bread stuffing with sage. It was the best! Her own gravy. Now she did use the canned cranberries and one year when Ocean Spray got fancy and added the whole berries to their line, she bought one. No one liked them except her. My sister and I loved how the jelled cranberries would slide from the can, and she'd slice it. Now THAT'S Thanksgiving! I remember as a kid asking my mom if we were going to have the "real cranberries" for Thanksgiving one year. "You know, the one that slides from the can". 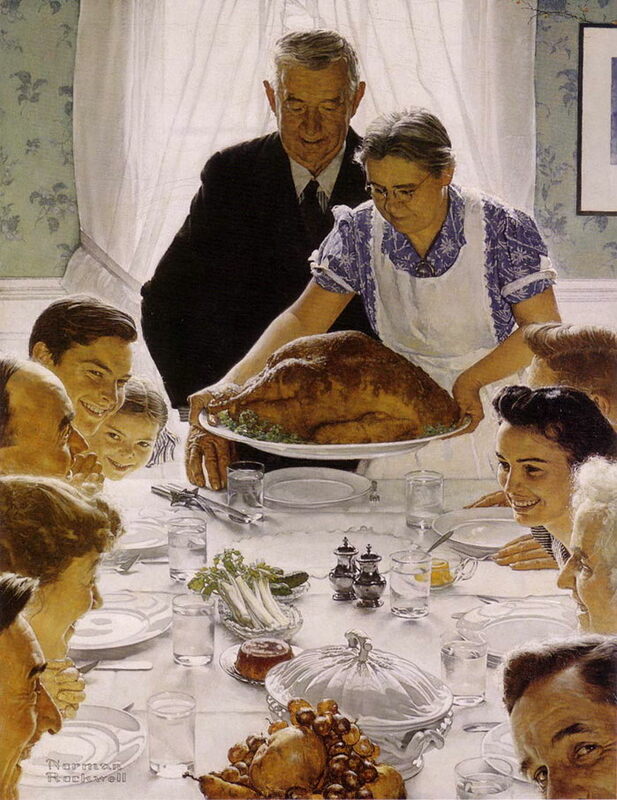 One year my sons ate a turkey dinner at a friend's house and she used stove-top stuffing, which I never cared for. They loved it. They refused to eat my homemade stuffing so I switched over to Stove-top and it was never the same. Finally last year, I just told them. "You are adults now. I am stuffing the bird with my own homemade stuffing. I will make a side of stove-top for you". That seemed to work. Throughout the years I have made last-minute adjustments - one year I was sick, so I had my husband go out and buy some frozen pies. You would have thought I had committed a major crime. They were fine plus no one was coming over so what's the big deal? Gravy? Now that's something I am quite proud of, I always make my own gravy BUT I always buy a packet or two just in case I blow it. Which I haven't after 35+ years. Then I just use those packets for leftovers. For years I avoided that classic "green bean casserole" like the plague. We'd go to someones home during Easter or around the holidays and it would be served and my family ranted and raved at how good it was. Sorry I just don't "feel the love". I like fresh veggies... So what does MOM know? Last year, I decided to make it and of course, they all loved it. As for rolls, mom and was a brown and serve gal. I like freshly baked sourdough bread and butter. Nothing fancy. I've done brown and serve, I've done the Pillsbury Crescent rolls, that I always forget to bake on time, and I've used Hawaiian bread rolls. One thing I will say - I hate food snobs. If you are invited to my house for dinner and I serve you stove-top or cranberries from a can, eat or shut up. It's a free meal. Just as when I go to your house I am thankful to not have to cook. It's all food. Bottom line - It's Thanksgiving. Enjoy, be thankful and eat! Anything I don't have to cook is wonderful. I never liked stove top; but, I too was raised on homemade cornbread dressing. We make it with chicken and call it chicken pie. Not much of a pie but that is what we call it. This is a new generation so I am not surprised your son's love the Stove Top. My sons are becoming men. This year, they both agreed, that I can now make my own stoving. They are "over"their Stove-top cravings. I wish they had told me BEFORE. The only thing I bought on your list was the fresh Butterball turkey. I usually buy fresh locally grown turkeys, but I was in the store and it was on sale, so there. I am pretty sure there is not one other item in the cart that I want to fix. Have a Happy Thanksgiving. I had a butterball this year. It was good. I baked sourdough baguettes this year. The kids brought the pies and salad.